ARLINGTON, Va. – Washington Capitals captain Alex Ovechkin won the 2012-13 Hart Memorial Trophy, awarded "to the player adjudged to be the most valuable to his team," the National Hockey League announced today. This marks the third time Ovechkin has been named the League’s Most Valuable Player. The 27-year-old Moscow native is the only active player to have won the Hart Trophy multiple times (2007-08, 2008-09, 2012-13) and becomes just the eighth player in NHL history to win the award three or more times, joining Wayne Gretzky, Mario Lemieux, Bobby Clarke, Bobby Orr, Gordie Howe, Eddie Shore and Howie Morenz. 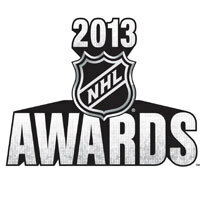 Ovechkin was a finalist for the award in 2009-10. He earned 1,090 points for a margin of victory of 32 from a record-setting 179 ballots cast. In 2009 Ovechkin became the first player in more than a decade to win consecutive Hart Trophies (Dominik Hasek, 1997-98) and the first non-goaltender to do so since Gretzky won eight in a row (1980-87). He became the third youngest player to win consecutive Hart Trophies, trailing only Gretzky and Orr. Ovechkin scored 32 goals in 48 games this season to earn his third Richard Trophy in his career and became the first player in the trophy’s 13-year history to win the award three times. Ovechkin is the second Capital to lead the league in goals, joining Peter Bondra (1994-95 and shared the lead in 1997-98) and became the oldest player (27) to lead the league in goal scoring since Pavel Bure (29) in 2000-01. Ovechkin also led the NHL in power-play goals (16), shots on goal (220) and tied for the league lead in power-play scoring (27 points). Ovechkin finished the 2012-13 regular season with 56 points (32 goals, 24 assists), tied for third in the league in scoring. The Caps captain finished the regular season with 23 goals and 13 assists in his final 23 games. In that span of 23 contests, Washington went 17-4-2. The Capitals finished the season with a record of 27-18-3, first in the Southeast Division and the third seed in the Eastern Conference playoffs. Washington went 23-7-2 in games that Ovechkin tallied at least one point and 19-3-2 in games in which he scored a goal. He led all Caps players in third-period scoring (15g-8a) and tallied seven goals and three assists in the game’s final 10 minutes or overtime. In his 579th career game Ovechkin became the third-fastest active player to reach the 700-point plateau, behind only Teemu Selanne (541) and Jaromir Jagr (557) and the fastest player to reach 700 points since Peter Forsberg did so in his 549th game in October 2003. Ovechkin became just the third Capital (Bondra and Mike Gartner) to record 700 or more points as a member of Washington and just the 22nd player to record 700 or more points in his first eight seasons. This was the eighth consecutive season that Ovechkin has tallied 30 or more goals. The Caps captain is the only player to have recorded 30 or more goals each season since 2005-06 and is one of just nine players in NHL history to score 30 goals in each of his first eight seasons in the League, joining Glenn Anderson, Mike Bossy, Gartner, Gretzky, Dale Hawerchuk, Jari Kurri, Luc Robitaille and Bryan Trottier in that accomplishment. Members of the Professional Hockey Writers’ Association submitted ballots for the Hart Trophy at the conclusion of the regular season.